Near Down town Aurora. Glenview runs off Route 82 (East Garfield Rd.) just East of Rt. 43. A great sale not to be missed!! Please bring help to load purchases, not liable for any injury or accidents. entrance numbers at 8am Sat. Will be required to wear our supplied shoe covers or sock or bare feet. 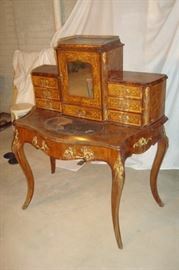 Fine 19th century Louis XV French marquetry inlaid Ladies writing desk with bronze ormolu mounts and pulls. 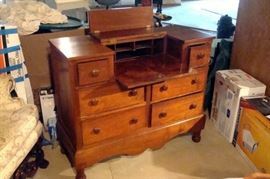 Different view Ladies writing desk. 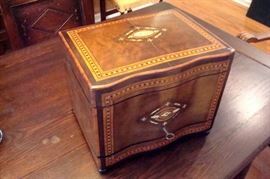 This item of antique furniture needs some touch up as it sustained some moisture damage recently. 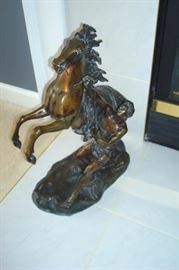 But a very rare piece and worth any effort for partial refinishing! No structural damage but some areas of finish leached off. 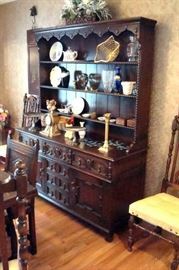 Spanish/Flemish influence antique dining suite with dark oak table which has hidden leaves, eight chairs as shown, an open cupboard and a high boy china chest. C-1870. 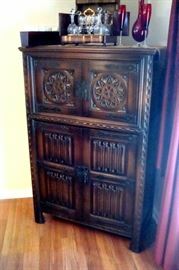 The high boy china chest. 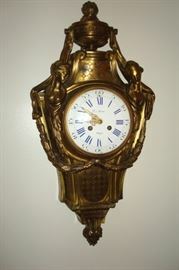 Bronze French Wall clock by Henry Vincent, 1855 Paris. 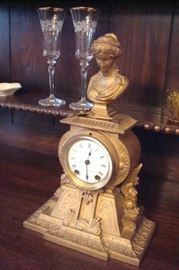 A Seth Thomas bronze shelf clock. 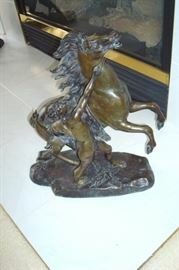 One of a pair Roman themed bronzes. These measure about 18 inches in height and about 12 inches long. Will list artist if found. 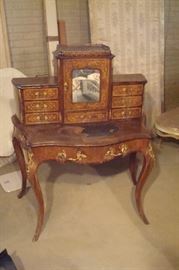 Empire period walnut butler's desk. Rare French 19th century marquetry inlaid tantalus with original etched decanters and stemware. 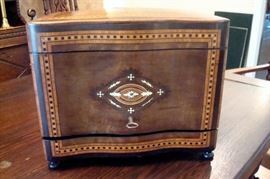 19th century French Bombe commode with cross banded inlay and hand painted porcelain pull inserts. Thomas C. Blake, Scottish 1890. Very old oil painting. Probably from the early 1800's. will list artist if found. Approximately 11' 7" by 11' 9" fine, hand knotted wool oriental semi antique Persian rug in great condition. Close up of fine weave. Hand painted two fold screen. Antique stand and dragonfly lamp. 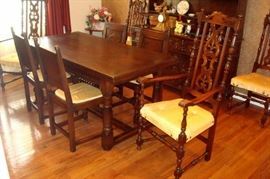 One of a pair cherry tables. Period Flemish upholstered arm chair. Fine quality Hickory sectional sofa and coffee table. Five stack antique Barrister's book case. Additional mid century Cushman bed and lamp stand. One of a pair mid-century Cushman beds. These beds were owned by the last American killed in World \War 2. and are labeled " A Genuine Cushman Creation"
Desk and chair to bedroom suite. Will be priced separately. Oval marble top coffee table. Pair Flemish style wing back chairs. Antique mahogany console table with antique push up brass candlesticks. Antique lamp with Mt. Washington peach blow shade. antique converted peach blow glass lamp lighted! Glass top wrought iron table and chairs. Oriental style rug.